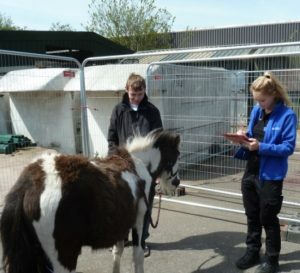 The day started at 7am when the BHS welfare team arrived on the yard, followed shortly afterwards by charity representatives and volunteer professionals. Gemma Stanford, Head of Welfare and Passports, was responsible for the organisation of the day and held the briefing at 8.30am. The lead vet for the day also gave a briefing to the team prior to 9am; the vets were all volunteers through the British Equine Veterinary Association Trust, who had kindly given up their time to help this great event.